Isn’t this a great image? Ayden A., 10, drew this. He has type 1 diabetes (T1D), like me. His mom sent this to me in response to one of my requests on InsulinNation for art by those with this condition. I want to connect with others with T1D. I also want to practice my preaching that we're stronger together. I'm looking to answer: What will happen to me and my writing if I work with other artists? For my art requests, I’m intentional vague on what I want to see. My parameters are flexible. I’m simply looking for images that people feel tell something about themselves and their stories. Flexibility is a powerful and scary skill to practice. We like control. Flexibility requires a release of control. It takes courage. I was reminded of this in a great TED talk by Harvard Medical School psychologist Susan David, called The Gift and Power of Emotional Courage. She's also written a book on this flexibility, called Emotional Agility: Get Unstuck, Embrace Change, and Thrive in Work and Life. As I was absorbing this talk, my mind went back to Ayden's picture. I’d had a strong reaction to it initially. With Dr. David’s words running through my head, possible reasons appeared. 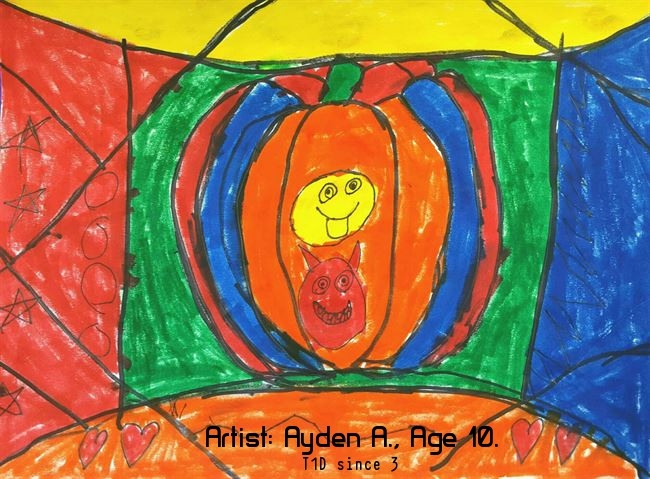 In Ayden’s art, I see a pumpkin with two faces in it. One, a regular smiling face. The other, what appears to be a devil in red, also smiling. Both faces are framed together within a single segment of the pumpkin’s rind. Perhaps Ayden feels like he has different things inside one whole. I know I feel that way. There are days when I’m feeling great. And there are days when absolutely everything feels awful and I wish for a “get off this crazy ride” button. Both his faces are smiling broadly, but very differently. That reminded me of Dr. David’s admonitions on false positivity. In the loss of her father, she described herself as the master of being OK. She wasn’t and hiding it only made it worse. We do that quite a bit, whether we have diabetes or not. That devil’s grin has teeth. If we try to smile all the time and simply reply, “I’m OK!” without thinking, we’re lying. We’re hurting ourselves. We have a huge pile of emotions, none of which are bad. We need to accept them all and be open to what they can teach us about ourselves. To me, Ayden’s picture shows that. Having only just entered double-digit age, he’s depicted a whole person (pumpkin) contains many feelings. We are complex. Our lives are complex. We can’t hold everything in a certain place. Dr. David indicates in her talk that many people want feelings to go away. Alas, “Discomfort is the price of admission to a meaningful life.” We are not our anger, fear, jealousy or disappointment. Nor are we happy. We feel these emotions and they tell us something about ourselves and situations. Life’s not all neat and perfect. That’s another thing I like about Ayden’s drawing. He colored within lines but there’s a mix of the real and the imaginary. There’s a corner that maybe should have been green, but is red. The pumpkin is partially blue. He’s added hearts and stars with pencil. Not everything is just simply blocks of color. And why not? Life’s like that. Unpredictable. Pleasure within pain. 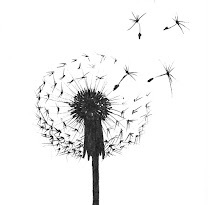 Growth within change. "Emotional agility is the ability to be with your emotions with curiosity, compassion and especially the courage to take values-connected steps." We can all benefit if we do this. In fact, if I had one complaint in Dr. David’s theory, it would be a greater emphasis on the need for us to understand how linked we all are and how we all need to participate. I know so many people who have been reduced to living with this one mantra: “Keep your head down and just get through it.” The “it” can be anything. Sometimes diabetes feels like that. There isn’t even the false positivity to hide behind. We can (and must) all help each other out. We can all get through more if we do it together. I’ve been able to understand more things by looking at Ayden’s art and listening to Dr. David’s research, just as I was able to flesh out my messages of support for teachers in Dear Teachers using the images of my friend, Marlene Oswald. I thank Ayden for his work, both artistic and as a Diabetic Warrior, and his mom for the opportunity to show this in one example and I hope to do more in the days ahead! Stay tuned and keep sending that T1D art (from all ages!) to dearwarriors2018@gmail.com!